Diana Scott (Julie Christie) is an internationally famous woman. From a young age, everyone who knew her could predict that she was going to make something of herself. Speaking to a reporter, she reflects on the sequence of events that brought her to prominence, from the stage plays of her youth to her career as a model/actress, including the many romantic successes and failures she faced along the way. Living in London in that sensational, swinging decade of the 1960s, Diana’s life has been full of excitement and drama. But is an exciting life a happy one? 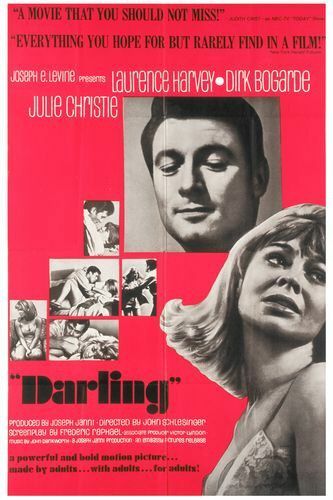 Darling was directed by John Schlesinger and written for the screen by Frederic Raphael. 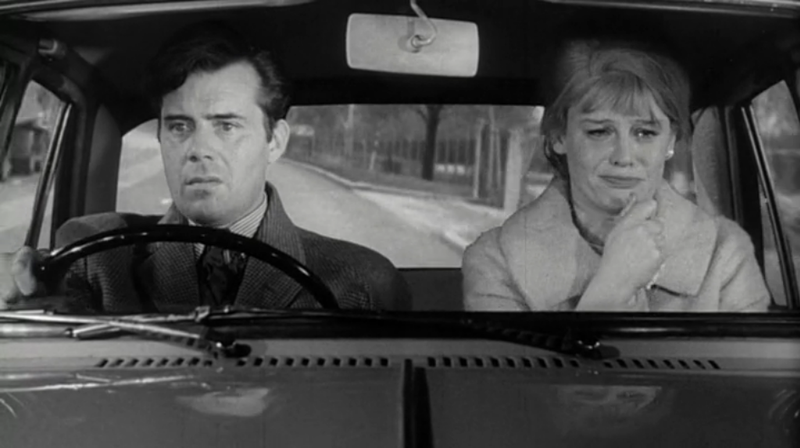 Starring alongside Julie Christie are Dirk Bogarde, Laurence Harvey, and José Luis de Vilallonga. Though this film does give the viewer a look at the atmosphere and culture of London in the ’60s, the focus is largely on a character study of Diana. The film explores the impact that the era has on her quality of life. It is a study of her happiness (or lack thereof). Happiness is an obvious theme of the film; at one point, Diana even gets a job as “The Happiness Girl” in an advertising campaign, during one of the unhappiest times in her life. The story is framed through Diana’s own narration of her life story to a reporter. She knows that this reporter is writing a story about her, so she isn’t just telling the tale for her own good — she’s telling it with the knowledge that the public will be reading it, and that it will play into their perceptions of her. It’s interesting for the film to be framed in this way, because despite all that happens, it in some cases keeps Diana from being villainized or shamed by the viewer. In other moments, it is made all the more clear just how opportunistic and calculating Diana is.